Since I was a baby we lived out in the country and so it was a long way to get to any store. Well except for a dingy looking corner store called Quick Stop. I remember planning with my younger sister about how we would get to the store to buy some candy, I had to be about 12 and her 10. We started saving up our allowances, every penny brought us closer to sweet heaven! When we finally hit our goal we figured out that it would take a few hours to get to the corner store so we hopped on our bikes, clicked on our helmets and took off early in the morning...we conveniently forgot to tell our mom of course. So we finally get there and my sister and I are almost crying because we are so tired but we gather up our energy and go into the store with our bags of change. I remember buying those Lucky Lights and Zotz like it was yesterday. 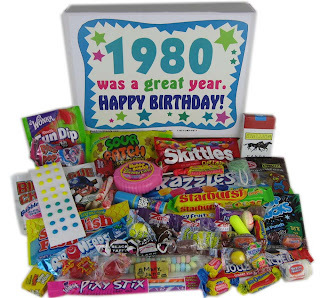 I remember dumping out or bags of change on the counter and counting it out to the cashier then the proud feeling of carrying our bulging bags of sweets out the door. We had a few drinks from our water bottles and then stuffed every last bit of our candy into our little bike bags that hooked onto the handle bars. The ride home was long, it started to rain and thankfully a lady from church picked us up in her van and took us home to our driveway. We hid our candy in the bushes at the end of our driveway and walked our bikes up, fully knowing we were in big trouble but to us it was worth it and to this day it is a fun memory with my sister that I cold never forget. My sister is no longer with me but the memory of her still lives on. Do you have any candy memories? Woodstock Candy will be giving away a candy gift box on Mama-Nibbles 6/18-6/24 so be sure to come back for the event Summer Solstice!